Lu Ann Brobst Staheli was an author, teacher, and mentor. She wrote thirteen books in the young adult, middle grade, educational, and romance genres. She was honored with many writing awards, including Best of State twice and the League of Utah Writers Golden Quill Award. She served for a time as president of the League of Utah Writers. She also worked as an editor for other writers whose published works appeared on the New York Times, USA Today, and LDS book bestseller lists. She was a ghostwriter for several celebrity memoirs. 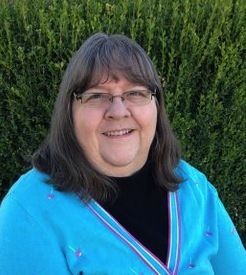 She taught school at Payson Junior High School for thirty-three years and served as head of the English department for over fifteen years. She later served as the school librarian. Staheli advocated literacy and wrote a weekly newspaper article that focused on book reviews to encourage children to learn to love reading. She also received numerous educational awards, including the Christa McCullough Fellowship, National Board of Education; the Utah Best of State for best teacher K-12; and Nebo School district English teacher of the year. She was the 2015 mentor of the year for Writing and Illustrating for Young Readers. Her book titles include Men of Destiny: Abraham Lincoln and the Prophet Joseph Smith; Tides Across the Sea; Just Like Elizabeth Taylor; Leona & Me, Helen Marie; A Note Worth Taking; Temporary Bridesmaid; “A Fezziwig Christmas” in the Silver Bells Romance Anthology; When Hearts Conjoin: The True Story of Utah’s Conjoined Twins; Psychic Madman; One Day at a Time: Teaching Secondary Language Arts; and Books, Books, and More Books: A Parent and Teacher’s Guide to Adolescent Literature. Staheli was born on April 27, 1954, in Alexandria, Indiana. She married Michael Douglass Staheli and they had five sons. She passed away on February 9, 2015. She was a member of The Church of Jesus Christ of Latter-day Saints. This page was last edited on 5 February 2016, at 20:28.